Oops! If the mainstream media was hoping that the Climategate scandal would be limited to the University of East Anglia's Climate Reasearch Unit (CRU) in Norwich, England, they are out of luck. This scandal has now reared its ugly head on the other side of the globe at New Zealand's National Institute of Water and Atmospheric research (NIWA) which is that nation's chief climate advisory unit. In New Zealand’s case, the figures published on NIWA’s website suggest a strong warming trend in New Zealand over the past century. 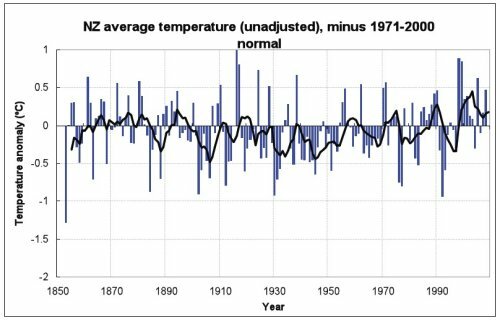 Figure 7: Mean annual temperature over New Zealand, from 1853 to 2008 inclusive, based on between 2 (from 1853) and 7 (from 1908) long-term station records. The blue and red bars show annual differences from the 1971 – 2000 average, the solid black line is a smoothed time series, and the dotted [straight] line is the linear trend over 1909 to 2008 (0.92°C/100 years). Yeah? What is going on? Why did NIWA frighten your humble correspondent? Why does NIWA’s graph show strong warming, but graphing their own raw data looks completely different? Their graph shows warming, but the actual temperature readings show none whatsoever! It is relatively easy to find out. We compared raw data for each station (from NIWA’s web site) with the adjusted official data, which we obtained from one of Dr Salinger’s colleagues. NIWA’s David Wratt has told Investigate magazine this afternoon his organization denies faking temperature data and he claims NIWA has a good explanation for adjusting the temperature data upward. Wratt says NIWA is drafting a media response for release later this afternoon which will explain why they altered the raw data. “No, no,” replied Wratt before hitting out at the Climate Science Coalition and accusing them of “misleading” people about the temperature adjustments. Manipulation of raw data is at the heart of recent claims of corrupt scientific practice in climate science, with CRU’s Phil Jones recently claiming old temperature records collected by his organization were “destroyed” or “lost”, meaning researchers can now only access manipulated data. So far this New Zealand scandal remains unreported in the American MSM but, to its credit, there is a report on this latest Climategate outbreak across the pond by James Delingpole the UK Telegraph. Meanwhile, if the U.S. media ever pull their ostrich heads out of the sand, they will have a huge amount of catching up to do in this scandal.